The European Commission continues to promote and support research and development as well as innovation in Nanotechnology, mindful of the safety aspects of these emerging technologies. Ensuring the safe development of nanotechnologies, through a sound understanding of their potential impact on health and on environment, and through the development of tools for risk assessment and risk management, is key factor to fully harvest the benefits from their deployment. The Conservation of Cultural Heritage is one of the many fields of applications of the nanomaterials. Historical Buildings and works of art are threatened by a great variety of deterioration agents (climate and pollutants) which can affect very seriously the materials. Actually, the same factors acting on the historic substrates are effective also on the products used for conservation, reducing their efficacy and removability. At the same time the widespread application of nanomaterials confers enormous potential for environmental release and human exposure. The NanomeCH Cluster aims at defining collaboration, synergies and productivity overlap between five FP7 projects involved in the ENV-NMP.2011.2.2-5 and ENV-NMP.2011.3.2.1-1 FP7 calls: HEROMAT, IMAT, NANOFORART, NANOMATCH and PANNA. 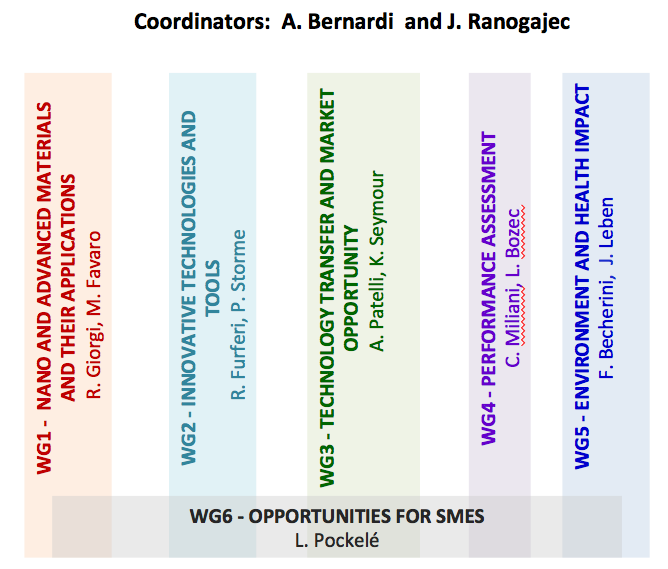 The Cluster is structured into highly interlinked working groups that covers the main domains of MATERIALS and APPLICATIONS, TECHNOLOGIES and TOOLS, MARKET, PERFORMANCE, ENVIRONMENT and HEALTH, OPPORTUNITIES for SMEs. The creation of the Cluster was strongly encouraged by the European Commission and the first meeting was held on the occasion of the EUROMED 2012 Conference in Cyprus in October 2012, when the representative of the five projects for the first time discussed common issues, challenges etc. The NanomeCH Cluster between five European projects on Cultural Heritage could act as a powerful mechanism for sharing knowledge and experience within a network of different stakeholders active the Cultural Heritage sector such as research institutions working on materials and technologies for heritage applications, policymakers, manufacturing SMEs and other industrial companies, conservators, galleries, museums, representatives from heritage sites, etc. The mission of the Cluster is to disseminate of the results of the projects and eventually contribute in maximizing exploitation opportunities by SMEs and help improving Cultural Heritage sector. In particular, the deep involvement of the SMEs and other industries manufacturers of materials, providers of conservation technologies, conservators etc., is extremely important as they represent the alive bridge between the implementation of the projects research and the needs of the sector.